Does not play or even load properly in a Region B player. Plays properly only when player is switched to Region A. Therefore region locked. Same is true of other US BD sets Jack Irish Set 2 and Jack Irish: The Movies. 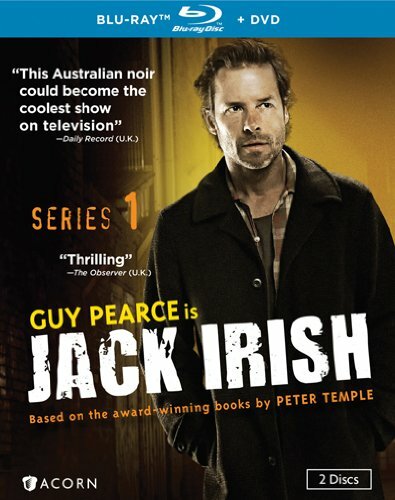 Emmy® winner Guy Pearce (Memento, Iron Man 3) is Jack Irish, the brooding antihero of Australian writer Peter Temple’s award-winning novels. Reeling in the wake of his wife’s murder, the former lawyer has reinvented himself as a part-time private investigator and full-time alcoholic, intent on drowning his demons. When an old client dies after leaving Jack several frantic voicemails, the PI realizes he can’t outrun or outdrink his past. Jack returns to the world that took everything away from him—a seedy place of lowlifes, corruption, violence, and retribution. In these two feature-length mysteries, Bad Debts and Black Tide, Pearce delivers a “mesmerizing” performance (Daily Record, U.K.), imbuing Jack with world-weary gruffness and a dash of dark humor. As much as he tries to break away, the underworld is where he thrives—and the only place he can find redemption.